This attractive bracelet for women and girls showcases a prong set of 5x3mm oval genuine or created gemstones and chain which adjusts to fit your wrist. The bracelet is crafted of sterling silver and is nickel & tarnish free. It adjusts from 3-inches up to 10-inches long. 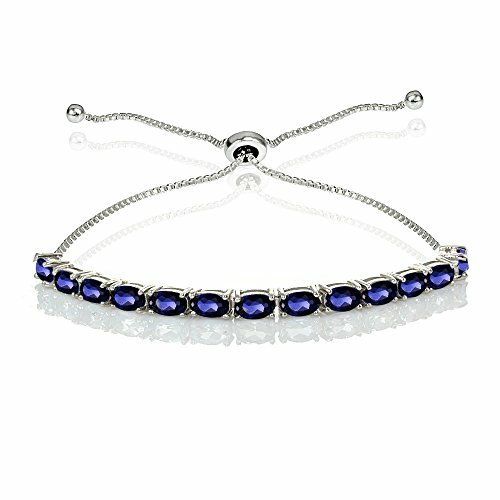 FEATURE - This attractive bracelet for women and girls showcases a prong set of 5x3mm created blue sapphire oval gemstones and chain which adjusts to fit your wrist. CRAFTED - The bracelet is crafted of sterling silver and is nickel & tarnish free. It adjusts from 3-inches up to 10-inches long.